We look here at May 17 to 20 2017, 20 with the missing gap, a huge opening lead (amongst many other large ones) spanning a great deal of the distance from Russia to Canada, something like 2 to 4 kilometers large, getting bigger daily, moving 10 kilometers in 3 days, you can't miss it, it is the biggest black line, clearly open as we see it through the clouds. 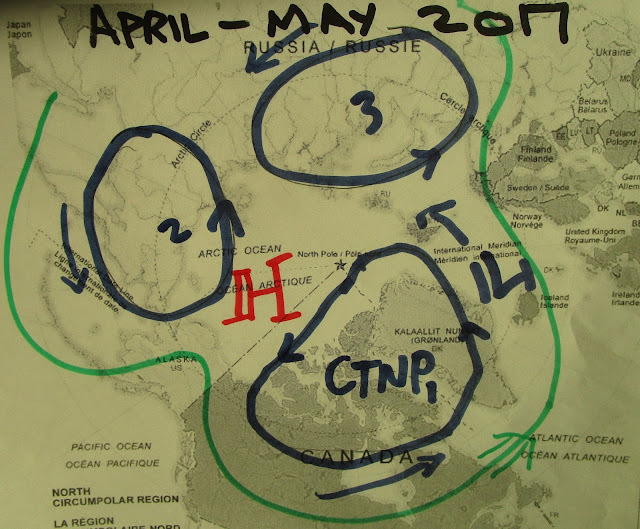 Spring break usually occurs on the coastal areas, when rotation of the much consolidated pack usually turns with the Arctic Ocean Gyre current, clockwise. If the pack is not so one piece of frozen mass, then the break should occur everywhere else as it does indeed. Annual a bit late 2017 Northern Hemisphere summer-fall-winter projections forecasts, by unique data acquisition means. ~ A surprise cooling temperature shift caused by too much snow on the ground, changed winter from all time cloudiest and warmest, to seasonal. 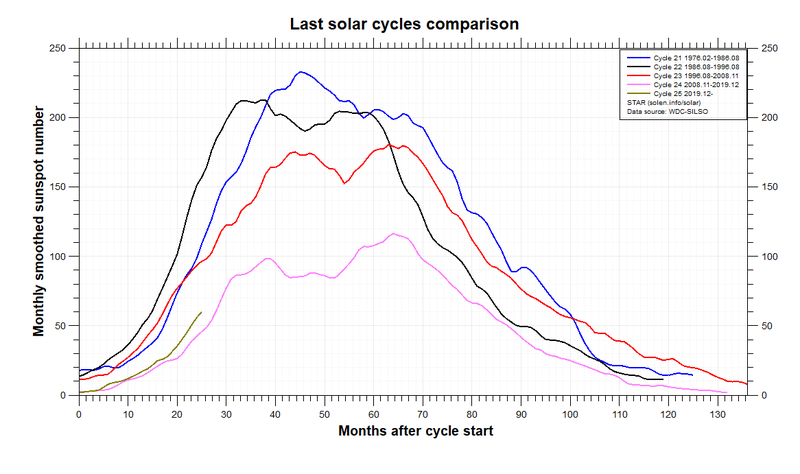 However sunspots don't seem to greatly impact the Total Solar Irradiance (TSI) currently at 1361 w/m2. 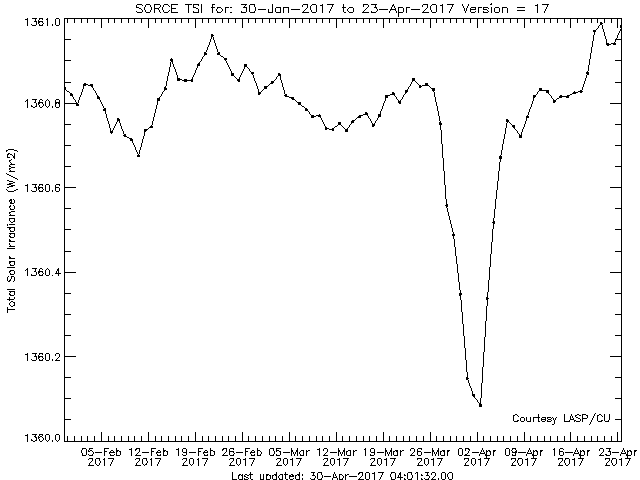 TIM graph just above, on April 1 2017, suggested if we consider "little ice age theory" analogy a drop in the number sun spots, a commonly thought direct relation for sun output, which would mean lesser sun spots. Above is what 1360 w/m2 looks like. End of April a tad brighter sun, with less a few less spots had greater energy output by a ruckus 1 W/m2. 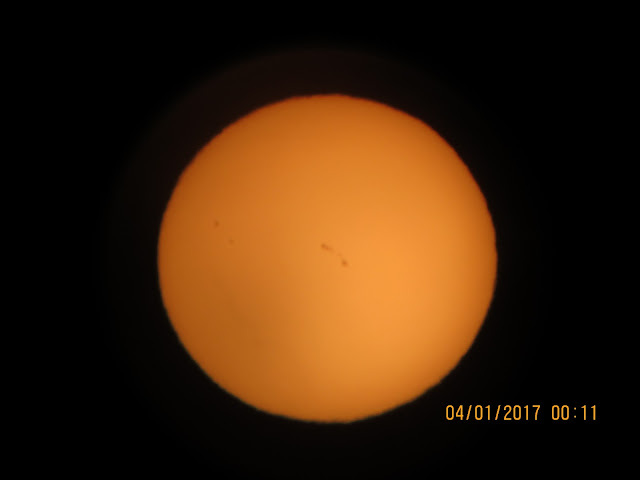 Sunspots not quite heat related despite being literally colder areas on the sun. April 14 2017 Katimavik sunset, named for a long ago, now 50th anniversary expo 67 Canadian pavilion. 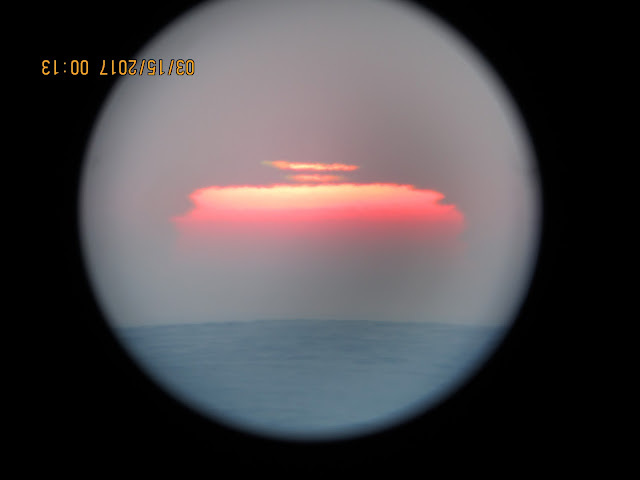 This sun set 3 degrees further Southwards, indicating a lack of a strong stable inversion temperature gradient. The interpretation of this may go 2 ways, either there is less warming above, or more warming at air next to sea ice, the former was the case. The atmosphere thickness here is in excess of 2000 Kilometers. This year, sunsets were commonly strongly Southwards in March, more Northwards in April, this reflected a sudden cooling of the entire Canadian Arctic which gained prominence as it spun a small vortex shutting down the East coast of North America. This cooling came from Central Ellesmere, partner in cooling crime with Greenland, dry air from the 2nd biggest glacier in the world, along with Ellesmere covered with thick snow which fell from moisture rich warmest Arctic winter in recorded history , changed this amazing cloudy warm winter to a normal end. The clouds were more scarce from about the time of greater cooling , coinciding with March early April usually not so cloudy period, allowing for many sun disk pictures, not as numerous as last year, but within the most numerous seasons, near 3rd place after 2016 and 2008. 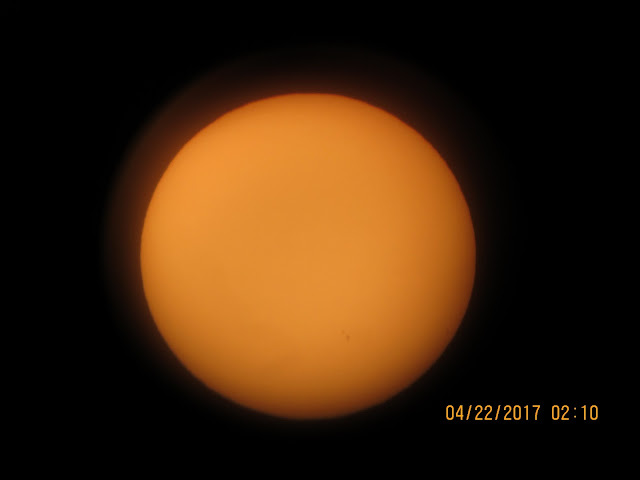 2017 has 490 observations to date, a year by year average of 6.25% for all decimal levels with maximum expanded sun disks should be considered normal statistical average. #1 expanded is 2016, with 15.8%, #2 2015, 11.7%, #3 2006, 9.2% #4 at 7.5%: 2005-2009-2010-2011- 2013, #5 2012, 6.7%, #6 2017 4.2%, #7 2004-2007-2008-2014, 3.3%, #8 2002, 1.7% , #9 2003 0.8%. 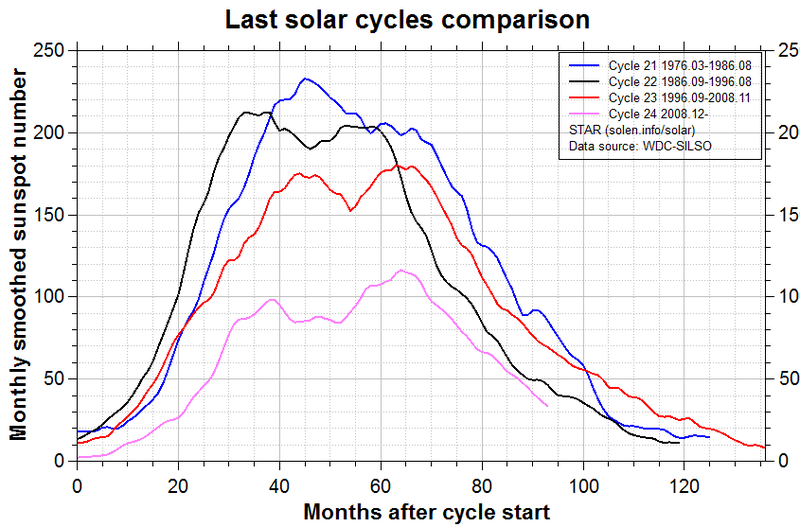 Although sun disk vertical dimensions data trends closely match Northern Hemisphere temperatures , this year may be an exception similar to 2014, largely because the playing field where the data was retrieved has drastically changed, namely because there was so much snow over wide expanses. Arctic snow cover was predictably often 10-20 cm thick in the past, not much, after all the Arctic has less precipitation than vast deserts. The spring time land and ice scape usually was a mix of land and ice interspersed by snow. 2017 went against the norm in a big way. 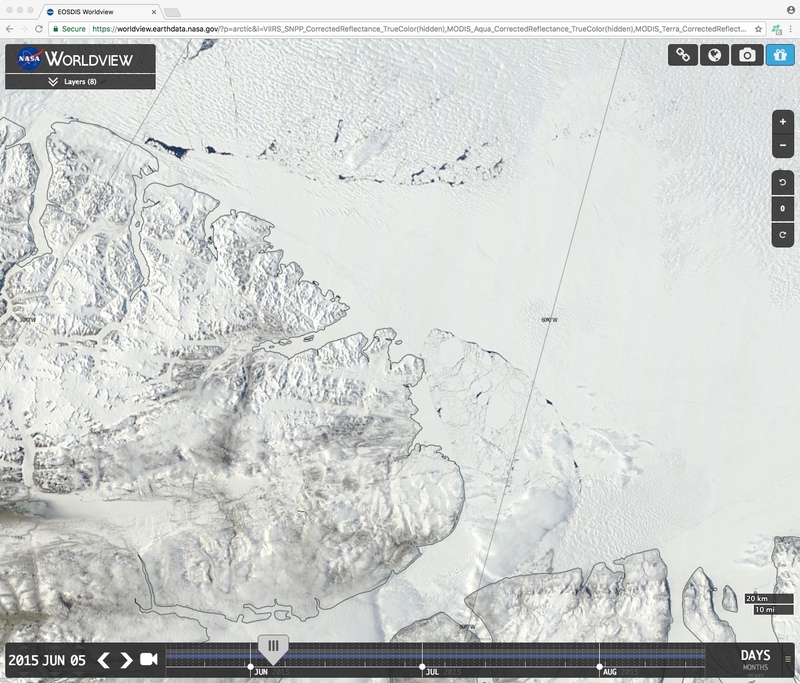 Local Barrow Strait shore sea ice should be about 200 cm thick by end of April, or end of accretion date. It is only 140 cm was so for a month. A lot of snow acts like sea ice proxy, it is currently a 60 cm insulation which replaced sea ice. Since the local physical landscape changed, I must change my approach to the meaning of sun geometry apparently changing course. 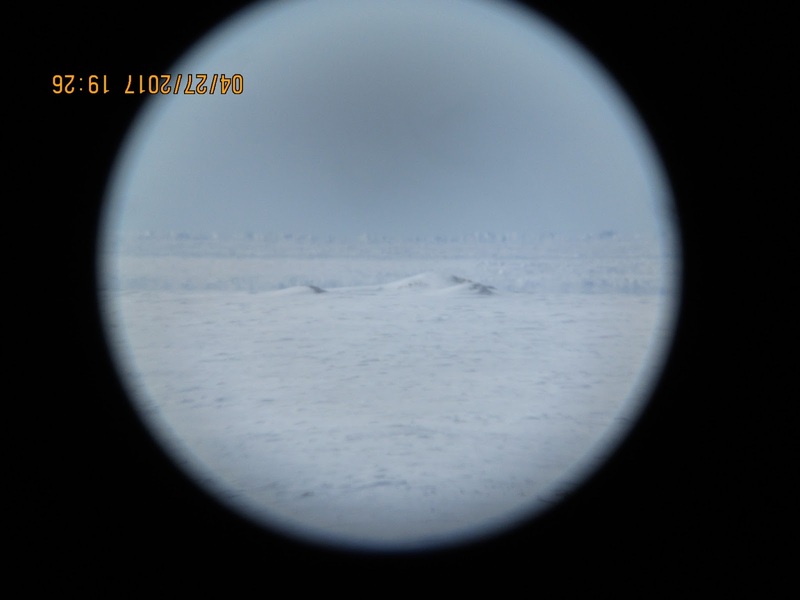 Spring First Melt occurs when Sea ice horizon goes down to the Astronomical Horizon for the first time since it formed, the air temperature immediately above becomes isothermal, air layers right above this isotherm may be warmer causing some illusions. by too much snow on top of sea ice, much more than 2016, more or less double. Snow replacing sea ice giving dissimilar optical effects is a new feature, from the unusual flood of snowflakes stemming from warmest winter in Arctic history. What we know about FM predictive power is related to the start of the melt season, since too much snow halted accretion for more than a month, the melt season also was delayed but from a thinner point, when this snow disappears in June, there will be huge water ponds, the ice will vanish extremely quickly then after. So the later first melt date would have significance if the sea ice thickness was more average in thickness. Otherwise, on a larger Arctic Ocean scale, if thick snow is laced all over the Arctic as it appears to be so, the illusion of a normal sea ice melt rate will last until severe sudden disintegration. 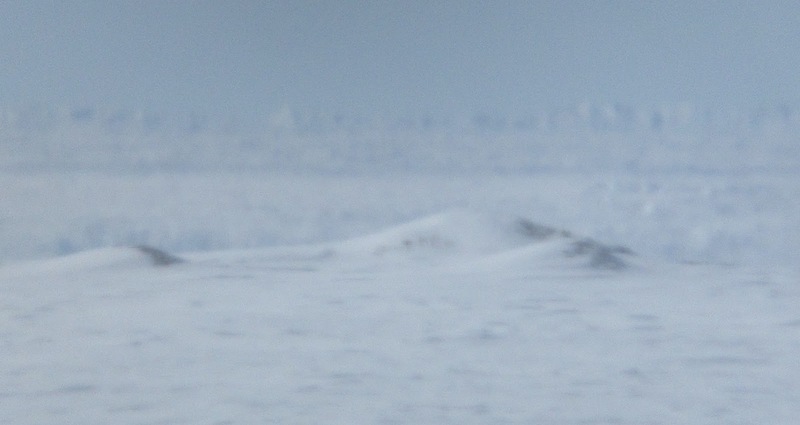 The jagged sea ice horizon usually happens at the Astronomical Horizon, it becomes distorted, by excessive heat in the air a few meters above sublimating snow, the gaps are likely due to various snow layering thickness, ice ridging, some old vs new ice, sun shade, describing diverse highly localized albedos. A cloudy Arctic should have cooled the stratosphere, but the warmest winter in Arctic history flat lined on the average trend, this is uncommon. 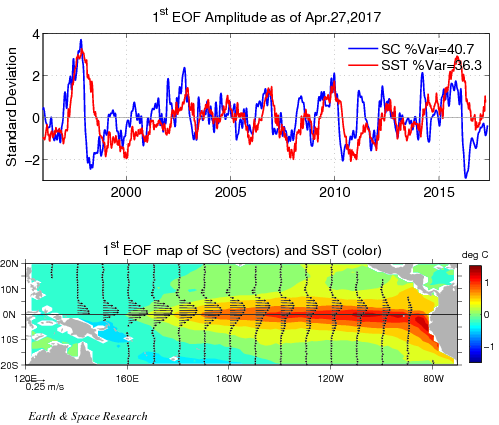 ESR ENSO marks no definite trend, much like a stall especially with the Sea Current, a trending La-Nina marked the spring time Arctic sky in 2016 conversely a very cloudier Arctic winter coincided with El-Nino trending. The Coldest air in the Northern Hemisphere has 3 cells, cell #1 and 3 are coldest, #2 warmed first. temperatures over land, warmer over Ocean as well. The North American- Greenland Cold Temperature cell will dominate as a normal Arctic summer, this should continue the stagnation of Anticyclones over the Beaufort Gyre, drier Greenland air will mix along with the clockwise flow making it more stable. Pacific Cyclones will intrude end of July. North Atlantic Cyclones will split directions between The Atlantic and Russian Urals, making the Arctic Ocean High stronger. As the last standing Cold cell lingers well North, Northern Canada will be wetter , Lows will mix it up and take turns standing over the Beaufort High, North Atlantic High will show up more often. 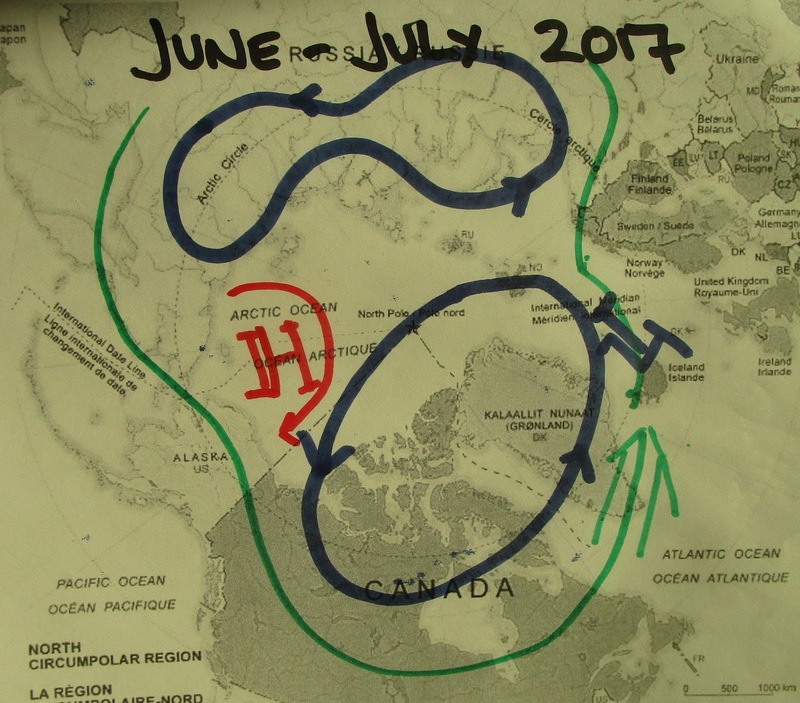 The damage done in July by persistent Gyre High will be finished off by Pacific and Atlantic Lows. This will cause a great deal more scattering of sea ice. There is no reason to believe that Tornados will be more frequent than average, there is a colder atmosphere than 2016 , but it is largely confined to the High Arctic Troposphere, its effect largely nullified in the warmer stratosphere without any greater high speed laminal wind formations as what made 2011 prediction successful. The Stratosphere is unusually normal, the very Cold at center -80 C Polar Stratospheric Vortex lasted a very short time, barely made a high speed spin around the Pole compared to other more prominent years. However heat contrasts will exist at the higher latitudes, perhaps displacing tornado alley Northwards. Hurricanes should be less frequent because the Sahara will be especially hot this year, its sand dust greatly affects Hurricane formations . Typhoons should be normal in numbers as with a Neutral ENSO season, since I have not seen nor detected any significant ENSO trend. In all years since 2004, this was the easiest thing to do, since I simply transposed or calibrated Arctic Sun disk vertical disk gains statistics as a defacto Northern Hemisphere temperature average. It worked marvelously well. But now , excess snow on Arctic lands makes it more difficult. The colder spring time Arctic Atmosphere should stall NH warming gains or temperatures trending upwards as within the last few years, making 2017 # 3 warmest in history. Difficult as it may be, the lowest volume of sea ice at 2017 Maxima, combined with consistent rapid sea ice displacement velocities and the huge amount of snowfall stemming from the warmest Arctic winter in history, literally makes it easy for a change, #1 least volume of sea ice come September, with a bit of a problem with extent predictability, because sea ice is spread out from continuous daily displacements. 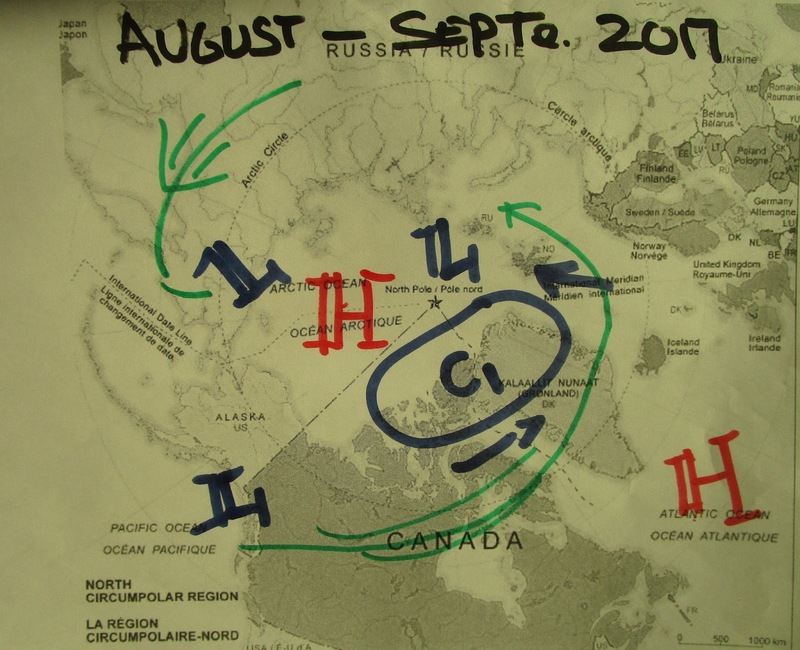 The East Siberian sea to North Pole "arm" or ice bridge will figure prominent again, but will be eventually wiped out given the Gyre circulation, made strong last year, was recently reinforced. The stable presence of an Anticyclone North of Alaska is normal when the Canadian Archipelago atmosphere is coldest, the clouds presence encompassing this anticyclone span is also very normal in spring. 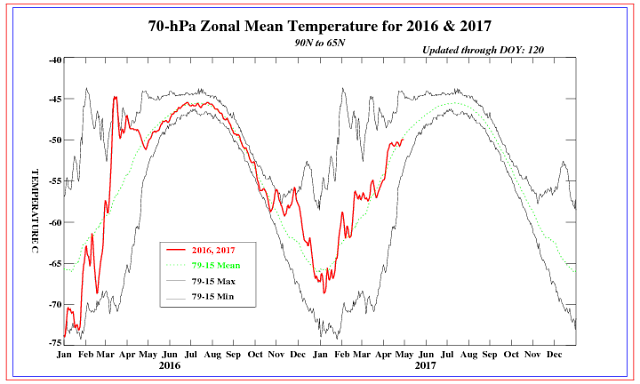 Eventually the temperature dew point spread will widden due to solar warming and the effect of a huge area High over the Arctic Ocean will hit like in 2007. I would expect record number of melt Ponds -late- from all that thick snow cover. This will accelerate the melt rapidly, numerous melt ponds will signal the start of very rapid melting, after seemingly sluggish melt daily rates interspersed with at times great variations caused by the lack of sea ice consolidation. The North Pole will be partially ice free because pack ice will be moving all over the place. A good Yacht Captain should be able to make to the Pole though. The Okanagan valley BC will be hot and dry at first then turn quite wet, Midwest North America will be mostly dry and very hot with clean air from the North except from forest fires, NE coast of Canada and US cooler wet turning same as Midwest come July. Finally Western Europe record high temperatures, not as much as North African records. fall mixing sea ice data with floating snow.